Journalist, Claire Santry, is most well-known in the Irish genealogy world for her indispensable blog, Irish Genealogy News. Those who have delved deeper into her output will also have come across her very useful Irish Genealogy Toolkit website. The website displays a depth of Irish genealogy knowledge that has been honed over many years. Her genealogical credentials also extend to being a fellow of the Irish Genealogical Research Society. Researchers have now been rewarded with The Family Tree Irish Genealogy Guide (2017, Family Tree Books, 238 pp. including index and appendices), her first genealogy book. Santry's publication aims to give the reader "a thorough grounding in genealogical techniques and point you [the reader] towards records you need to search, both in the United States and in Ireland." It does not disappoint. Many people are keen to jump straight into Irish records when they know an ancestor came from Ireland. In some situations this may be possible for very recent immigrants in the family tree, thanks to the mass digitization of Irish records. Starting out by gathering records in the U.S. is the reality for the majority and Part 1 (Chapters 1-3) focuses on the North American side of the Atlantic. Important records sets—federal census, naturalization, passenger lists, vital records, military—are introduced that are necessary for working back towards the immigrant ancestor and taking the steps to unlock where they came from in Ireland. The detailed knowledge shown about digitized U.S. newspapers, and where to access them, is impressive and readers should include this section from Chapter 11 in their reading of Part 1. Online research is now the starting point for many, so I was delighted to see Key Genealogy Principles in Chapter 2, where the differences between primary vs. secondary sources and original vs. derived sources are discussed. This chapter also stresses the importance of citations and research logs - concepts that many only discover after initial efforts turn into keeping track of hundreds of ancestors. Civil registration, church records, census records, and land/property records form the backbone of genealogical research in Ireland and this makes up the core of the publication. Santry's book has few peers when it comes to providing an in-depth discussion of these record collections and pointing out the various merits of each website that houses those records. This is an important feature for a genealogy research guide to have in the age of the researcher also being a consumer of subscriptions and pay as you go credits. History, Irish names/surnames and geography are well catered for, with an understanding of the latter crucial to researching in Ireland. 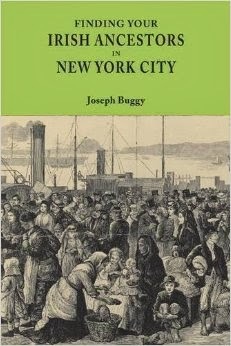 Important historical context is provided in the shape of Irish immigration to the United States and a history of Ireland that will help the newcomer to understand why their ancestors may have emigrated from Ireland and what they experienced in the U.S. when they arrived there. The author's detailed knowledge of Irish administration divisions and what records were created in them is impressively showcased, along with excellent map examples and useful online tools. Can you tell a Nonie from a Bedilia and why a Smith and a McGowan could be brothers? You will after reading about names and surnames . The two case studies about finding the Irish place of origin that are presented at the end illustrate the types of research than many people in the United States will have to do. They also provide an excellent insight into the realities of research and the various strategies that you will have to employ. It was also heartening to see DNA get a brief mention, as this is now a tool that can be utilized to help find the Irish place of origin. Previously, when asked, I used to primarily recommend two Irish genealogy books: Betit and Radford's A Genealogist's Guide to Discovering Your Irish Ancestors and Grenham's Tracing Your Irish Ancestors. That duo now has a new partner to make it a trifecta. It's available for purchase from the publisher Family Tree, as well as Amazon and Eason. A preview is available on Google Books.